Life Fitness X8 Elliptical Cross-Trainer is an electronic adjustable Stride Cross-Trainer which offers an ultimate experience of smooth and total body motion. This elliptical cross trainer has a basic workout console which provides an extremely easy-to-use interface with the essential workout programs that is needed to maintain an effective fitness regimen.It is best in customization and comfort with features such as on-the-fly electronic stride adjustments , low impact ellipse motion. FlexPedal Shock Absorption System lets the foot pedals flex, providing even less impact and more comfort than traditional ellipticals. ToughTrain 3.5 out of 5 No doubt it has above than average features but is too pricey. *Note: Most of the sites, stores or shopping portals listed above sell Life Fitness X8 Elliptical Cross-Trainer with discounts and other exciting offers. 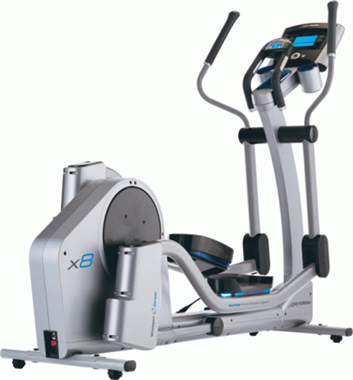 There is a possibility that the some of above websites are not selling Life Fitness X8 Elliptical Cross-Trainer now. Toughtrain.com is not liable for such cases or instances. Also we do not recommend any seller for Life Fitness X8 Elliptical Cross-Trainer and a buyer should buy from where he/she gets best deal with quality of products, service and on time delivery (shipment).